Start your creative pursuit today! There are 16 creative destinations located in Berrien County. To entice you to connect with each one, we’d like to challenge you to a game of Creative Pursuit. The more Creative Connections galleries, museums and theaters you go to between now and April 30, 2019, the more fun you’ll have and the more prizes you can earn. It's easy to get started. Just pick up a Creative Pursuit game map at one of the locations listed in the “Here’s How to Play” section below. You can earn this prize easily by collecting just three stamps, one in each Level 1 category on the Game Card inside the map. You can redeem this certificate at one of the 16 participating Creative Connections sites. 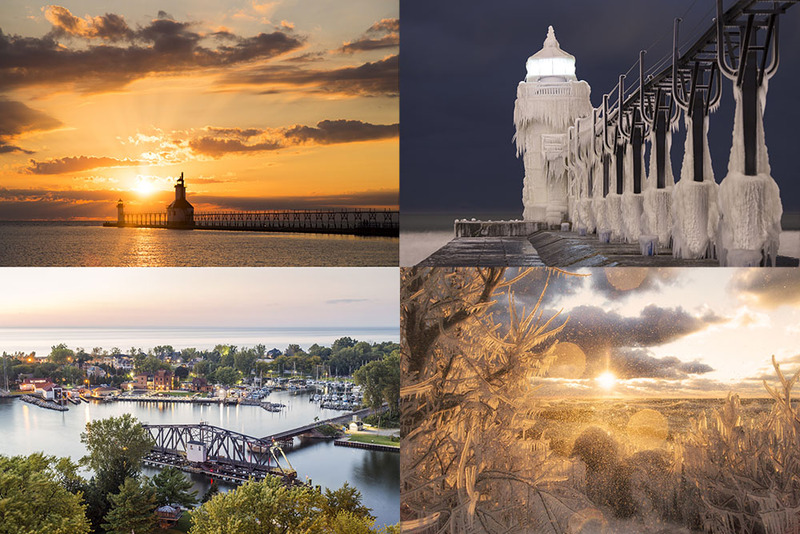 Joshua Nowicki is one of the most renowned photographers in Southwest Michigan. You can receive one of his signed landscape photographic prints by collecting one stamp in each Level 2 category (after completing Level 1). Choose your favorite from these four 8" x 10" images printed on metal. Make your selection on the Creative Pursuit game card. 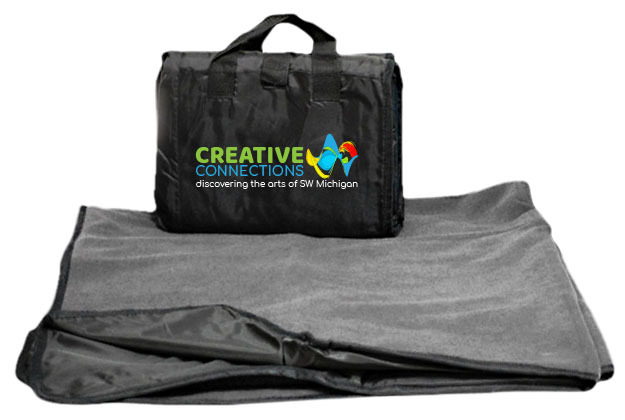 Get this water-repellent fleece picnic blanket when you complete Creative Pursuit Level 1 or Level 2 and stay at least one night in a participating hotel before April 30, 2019. Have your Creative Pursuit game card stamped by the hotel front desk staff before you leave. 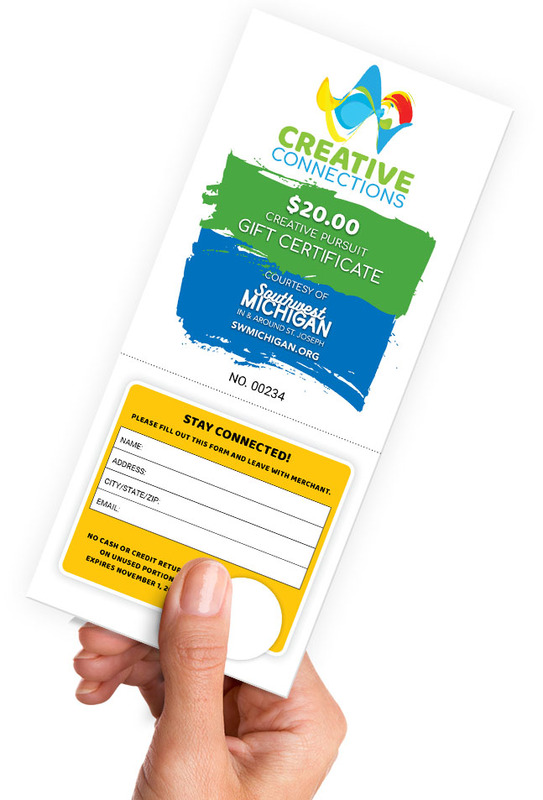 Once the Southwestern Michigan Tourist Council receives your completed Creative License and validates it, you will automatically be entered for a chance to win one of five Grand Prizes! 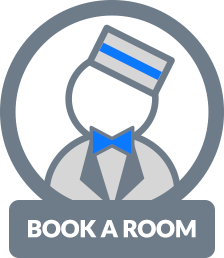 If you are selected as one of the five winners in the Grand Prize drawing, you will receive a two-night stay (double occupancy) at an area hotel plus gift certificates redeemable at area restaurants, Makers Trail destinations and other local merchants. The number of printed maps is limited, so please get yours soon. Inside this map, you will find the Creative Pursuit game card. Bring this map with you when you go to any of the 16 Creative Connections locations. To earn the prize at each level, you must go to one gallery, one museum and one performance. On the map, galleries are color-coded blue, museums are red and performance venues are green. When you visit the Creative Connections site, ask them to stamp your game card before you leave. Each site has a unique stamp that may be used only once on your game card. Duplicate stamps will not count toward earning prizes. Continue collecting stamps to complete one or both levels. If you add a participating hotel stamp to a completed Level 1 or Level 2, you will be entered into our Grand Prize drawing. See details about the prizes above. Once you’ve filled one or both prize levels with stamps, have your Creative Pursuit game card validated to claim your prizes (see details below). Keep your Creative Pursuit game card safe! Additional maps are available, but the stamps can only be replaced by revisiting the Creative Connections sites. It’s advisable to fill out the top portion of the Creative License, inside the map, as soon as you get it to avoid having it used by another person. Fill out the Creative License form in the Creative Pursuit game map. Do not remove the form from the map. Collect Creative Connections location stamps between now and April 30, 2019. Duplicate stamps will not count toward your prizes. Hours: Mon.-Fri. 8:30am-5pm; Closed Sat. & Sun. You may also wait to submit your map until you have completed all the prize levels you’re interested in, however completed Creative Pursuit game maps must be received and validated by May 9, 2019, to be eligible for earned prizes. If you submit your map by mail it will be returned by mail with your prize. If you bring your map to the Southwestern Michigan Tourist Council you can pick up your prize there and your map will be returned at the same time. The Grand Prize drawing takes place on May 10, 2019. The five winners will be notified immediately.